Left Photo... (Top) Judge Taylor, (Bottom L-R) James Ricketts, Billy Williams, Sam Walton. Right Photo... (L-R) Judge Taylor, Sam Walton, Billy Williams, James Ricketts. Click HERE for an article about The Roamers by Marv Goldberg. 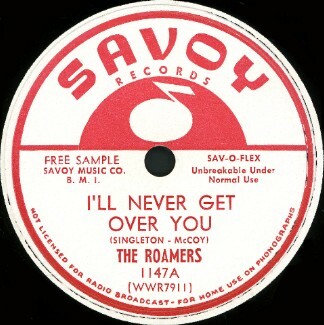 Above: Label for Savoy 1147 recorded on 11/18/54 and released in December 1954. James Ricketts sings the lead. 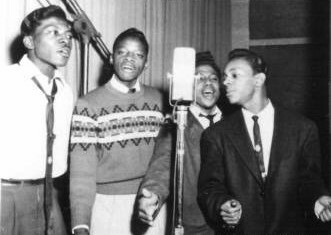 This was their first of two records for Savoy (1954-55), plus one record backing Wilbert Harrison (1955) and one side backing Varetta Dillard (1955). 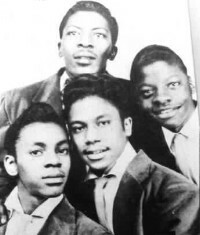 Click on an option below to listen to "I'll Never Get Over You" by The Roamers using RealPlayer.